On September 25, 2014, the residents of Triple Creek found out that Extraction Oil and Gas was planning a 22-well large-scale oil and gas site at a field adjacent to their neighborhoods. The proposed site is to sit less than 1,000 feet from the back porches of 13 neighbors, and the access road will run 30 feet from the home of another resident. The site will have 22 wells with tanks, separators, and large volume water tanks. During the initial construction phase (for the first year), one neighbor will see thousands of trucks roll thirty feet from her bedroom window. While Extraction initially promised these neighbors a “state of the art” facility with a pipeline system that would eliminate the tanks and truck traffic, that promise was soon reneged. 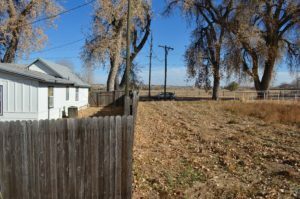 On January 5, 2016, the City of Greeley’s Planning Commission unanimously rejected the site on the basis that the main road was deficient to support that amount of traffic and a variety of health-related concerns. A few months later, on May 8, the Greeley City Council overturned that decision. 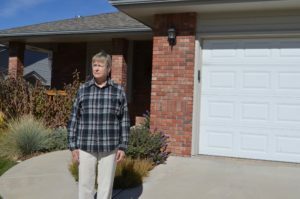 The neighbors at Triple Creek have spent the last year educating themselves, and working to be a part of the dialogue with the Colorado Oil and Gas Conservation Commission (COGCC) the state agency charged with administering all oil and gas operations in the state. Triple Creek is the first large scale oil and gas facility to be proposed within an urban mitigation area (UMA or neighborhood) since new rules regarding these large scale developments and surrounding neighborhoods were adopted in early 2016. 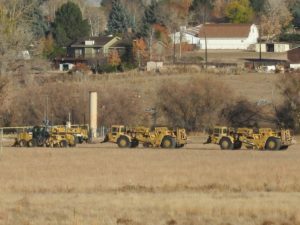 The neighbors at Triple Creek are asking the COGCC to implement best management practices that include the use of the best available technology, including pipelines, which would remove the oil storage tanks from the site. This alone would dramatically reduce concerns for petroleum spills and the escape of Volatile Organic Compounds, odors, dust pollution, noise at all hours, diesel fumes, eyesore and loss of property value, and traffic problems almost every time that a large oil tanker truck enters or leaves the site onto the heavily traveled, aging 71st Avenue and Sheep Draw Bridge. The project was given final approval by the COGCC on October 14 and Extraction began moving earth on November 4. Work has proceded very quickly and their construction foreman anticipates that his portion of the project will be completed and ready to turn over to the drilling phase of the work by the end of November. A 32’ tall sound wall now surrounds over half of the site and also boxes in the west and south sides of Dawn Stein’s home in the northeast corner of the site. All vehicles and heavy equipment are now using the access road which passes 30 – 50 ft. from Dawn’s bedroom window for entry to and exit from the site. However, we have recently requested that the COGCC Commissioners approve a public issues hearing with us, at which time, we can prove to them that the COGCC staff is not even following the new rules that they wrote earlier this year. We have in effect been put on hold and our request has been tabled while awaiting the Assistant Attorney General for COGCC affairs to commence meaningful dialogue with our oil & gas attorney. We acknowledge that Triple Creek will take place, but we want 1) the product to be piped away from the area for subsequent storage and trucking to the next production facility, and 2) our neighbor to be offered a reasonable settlement for her home which is no longer livable and may face eminent domain proceedings as 71st Avenue and the bridge are replaced by the City over the next two years. I wake up two or three times every night. For the first 10 or so seconds I’m at peace. Then I remember and the anxiety sets in: In my backyard Extraction Oil & Gas will be developing a HUGE industrial oil and gas production site with 22 wells and all that such a site entails, with a 2 ó mile horizontal drill, the longest ever attempted in Colorado. I tell myself it won’t be that bad, then friends and acquaintances who’ve experienced it first hand tell me not to be delusional. It will be worse than we expect. We have been living in a nightmare for almost one year now, since Extraction reneged on a commitment to pipe the oil offsite for production. We awake and start another dreaded day of phone calls, letter writing, meetings and presentations. We followed all the rules, but the Colorado Oil and Gas Conservation Commission (COGCC) didn’t follow their own regulations, and as ordinary citizens without deep pockets, we got screwed. It’s a terrible feeling to realize that as a Colorado resident and taxpayer, no one in government cares about you. I started this process believing nothing like this could happen in the middle of a residential neighborhood, within city limits. Then came anger as I understood that my city, my county, and my state do not give a damn about ordinary people when it comes to oil and gas. They pay lip service, and then it’s business as usual. Now, I’m extremely sad and bitter. It’s a terrible way to live. Look at Extraction’s website and read their “Community” page. “We take pride in cultivating positive relationships with our neighbors. After all, we live here and work here, too.” I’d bet that not one of their executives or managers live with a giant oil facility in their backyards. Extraction indicates they are an energy company “focusing on the exploration and production of oil and gas reserves in the Rocky Mountains.” And if they could get away with it I’m sure they would drill in the Rockies, maybe in the middle of Estes Park. I’m going to bed; I’ve had enough of this for one day. I want my life back. My property backs up to the recently approved Triple Creek Oil and Gas project putting my home at or within 1100 feet of this industrial size complex. This site is surrounded on all sides by residential housing. A large number of our neighbors have children. We also have three schools, University, Frontier and Northridge. We also have an assisted living complex and shopping center all of which access 71st Avenue. Why do I point this out? Because 71st Avenue, which is a small 2 lane street, is where the 200,000+ round trip 18 wheelers will be accessing the drill site! Our neighborhoods have fought the placement of this site for over 2 years. We played by the rules and were successful in getting our City Planning Committee to deny the site on a 6-0 vote. 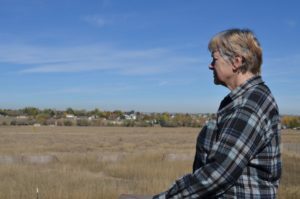 Their decision was supported by a Greeley Tribune straw poll taken in December (2015) where 70.74% of the respondents voted against the location of the Triple Creek drilling site (892 out 1261). Our City Council, however, on an appeal, by the oil and gas operator, failed in a 5-2 vote to uphold their appointed Planning Committee Members decision. The biggest travesty in all of this is that the Governor’s Statewide Task Force and the COGCC which is funded with state tax payer’s money has failed to protect homeowners and neighborhoods. If this location is a litmus test for siting oil and gas wells it can happen in any neighborhood. This is the first UMA site on the Front Range. We were hopeful, that on our appeal to the COGCC, that we would get the COGCC, at the very least, to stipulate mitigations that they wrote. This is a UMA site and, according to the COGCC, a UMA site is held to higher standards which include best available technology and seriously searching for alternative sites. 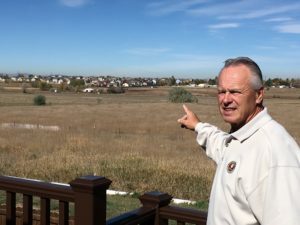 THE COGCC has failed to apply either of those standards on the Triple Creek site. My wife and I chose the purchase of this house with the strong intent that this was going to be a retirement home for us. The property behind our house was zoned R-L-residential low density. There was no reason to ever believe that an industrial size oil and gas complex would be located behind our house. Our life has been disrupted, to say the least, for the last 2 years as we and local neighbors fought this site for the obvious reasons. Our future now has 2 choices! Colorado is in a housing boom due to the obvious growth. In a recent publication by “The Group Real Estate Company in Fort Collins, Greeley, Fort Collins and Loveland are near the top in price appreciation. In fact Greeley is ranked 6th nationally in the article. However, my next door neighbor who also backs up to the drill site, is selling his house for nearly $30,000 under appraised value after having a similar offer pulled after the previous buyer found out about the oil and gas site. 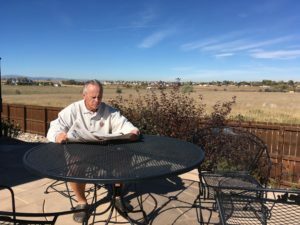 I have learned that there are two things you need to know if you are trying to sell your home and your home is in a direct line of site to a drill site such as Triple Creek. (1.) You would not want to sell your home during the drilling period as there is an obvious potential for a loss in value due to the oil & gas construction site. (2.) Once the wells are in production, intuition is a major factor in home values and sales. Therefore, buyers would see value in homes in or near neighborhoods where there are golf courses, open spaces and ponds but they would not see the same value in 22 oil wells and 22-44 crude oil tanks in their neighborhood or backyard. Homes like mine will lose value and prospective buyers based on the location of this site. Live with this site; Inheriting the 24 –7 noise from the drilling and fracking, unsafe traffic conditions and bright lights for close to 3-4 years. In addition, we will be subjected to any potential health problems that may develop for some individuals, as well as the visual impacts of this enormous industrial well site for the next 25-30 years. I have a hard time understanding why an industry like oil and gas is allowed to benefit while home owners and families are harmed and damaged. I certainly have a hard time accepting that our Governor and the tax funded COGCC do everything to protect the oil and Gas industry while failing to protect the families/homeowners who elect and fund them.